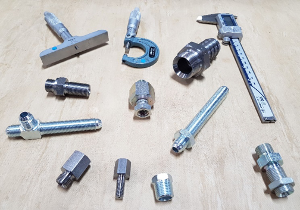 Burnett & Hillman of Wrington, has become a ‘brand name’ in its role as a major manufacturer of hydraulic adaptors and associated fittings that supplies into around 90 per cent of the world’s countries with a known customer base that exceeds 1,000 names. 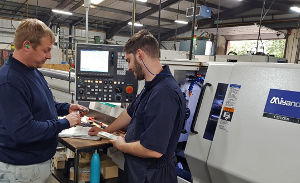 Its operation is mind-boggling having a standard range of over 4,500 different machined parts of which 99 per cent are held in stock for next day delivery. While its machine shop processes some 40,000 components a day consuming 200 tonnes of mild steel a month, these contribute to a massive year-on-year tally of over 10 million individual machined parts of which a quarter are directly exported. 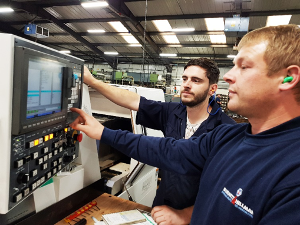 For smaller demands and batch sizes typically from 1 to 250 plus samples, the highly successful installation of five Miyano multi-axis machines from Citizen Machinery UK are certainly proving their worth enabling enquiry to quote within 12 to 24 hours. A new turned fitting can often be supplied within two weeks and out-and-out special within four. 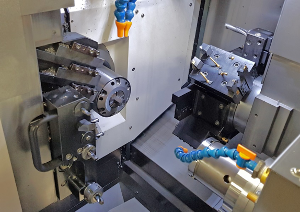 Following the reliability and consistent performance capability obtained from the first 12-axis Miyano ABX-51TH3 fixed-head turn-mill centre installed in 2008, the decision was made to standardise on Miyano and so three further smaller capacity Miyano BNA-42GTY’s were laid down in 2015 and 2017. In October 2018, the fourth BNA-42GTY was commissioned. Said Mr Burnett: “We face ever increasing demands for non-standard parts, smaller batches plus in-house store top-ups and due to the specification requirements of customers into our production, quality is the prime requisite followed by delivery. The 10-axis, plus three auxiliary axes, BNA-42GTY is configured around two spindles having 7.5 kW, 6,000 revs/min on the main and 3.7 kW, 5,000 revs/min for the secondary-spindle. It has a single 3-axis, eight-station turret which is carried with the two spindles on a single platform-like heavy duty surface table structure. The turret features half-indexing giving 16 driven-tool positions plus a 13 tool gang vertical toolpost with three driven tool positions brings the total machine capacity with multiple tool holders up to 45 tools. Importantly, the machine is able to accommodate 3-axis overlap machining with three tool simultaneous cutting involving either or both spindles. With the number of tool positions a standard suite of tooling is held on each machine with the largely ‘self-taught’ setters (with Citizen Machinery support when required) programming directly at the control. Here, most settings are achieved between 20 minutes and two hours.